Ketu, the South Node of the Moon means a "sign", or a "banner" in Sanskrit. If Rahu is the planet of worldly desire, then Ketu is the planet of otherworldly desire, or spirituality. Ketu represents the spiritual process of evolution, or the refinement of materialization to spirit. Ketu is considered a worldly malefic and spiritual benefice, as it causes sorrow and loss, which ultimately turns the individual to god. The karakas, or indicators of Ketu are focused intelligence, indicator of liberation, indicator of wisdom, non-attachment, other worldly interests, fantasy, penetrating insight, derangement, carrier of arms and weapons, invisibility and physic abilities. Ketu's gem is the cat's eye (Lehsuniya). This Graha is of a Pitta, or fiery temperament.Ketu has the last maturity of all the planets at age 48, when the soul turns to the pursuit of MOKSHA the pursuit of liberation from this world. Ketu general characteristics: Ketu is the rest of the body of Rahu, it bestows spiritual tendencies, asceticism, and nonattachment to worldly desires and ambitions. Ketu is also a half-planet that bestows wisdom, powers of discrimination, and gyana-spiritual knowledge, the knowledge of the self. It gives psychic abilities to its natives and makes them masters of the healing arts, natural healing, healing herbs, spices, foods, tantric healing, healing persons affected by evil spirits and ghosts. Ketu's sign is Pisces – as Rahu's is Virgo. The sign Pisces belongs the the guru, Jupiter, and Ketu also has dominion over it. Ketu's body is supposed to be composed of a man's torso in its upper half and a fish body as its lower half. Ketu is often depicted with a gem, or a star on his head, which emits a mystery light. Ketu is said to be a member of the Jaimini lineage of sages, who founded one of the several systems of philosophy of ancient India. There are wonderful myths associated with Rahu and Ketu. Ketu friends planet: Ketu is a friend of Mercury, Venus, and Saturn. Jupiter is neutral in friendship. Sun, Moon, and Mars are Ketu's enemies. Ketu signs and nakshatras: Ashvini, Mul, and Magha nakshatras are Ketu's nakshatras. Gemini, Virgo, Sagittarius, Capricorn, and Pisces are its friendly signs. Cancer and Leo are enemy signs. The Nagas of Vedic lore is serpent like, semi-divine beings, which offer knowledge, protection, as well as wrath and retribution to those they encounter. The forked tongue of the serpent's bite represents intoxication, the first being poison, resulting in dementia, the second being amrita, or spiritual nectar, resulting in ecstasy and divine consciousness. There is a story in the Puranas that tells of the God Vishnu dispensing AMRITA, the nectar of immortality to the Devas. While Vishnu was dispensing this amrita, a demon, Rahu mingled with the Devas and was receiving the amrita when the Sun and the Moon discovered him. 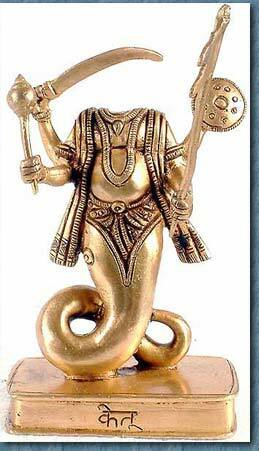 With the luminaries calling alarm, Vishnu threw his discus (Soodarshana Chakra) at Rahu and cut off his head. But, Rahu had already drunk the Amrita and now remained an immortal head, disassociated from an immortal body. Rahu is the strongest enemy of Sun and Moon. There is much lore and mystery surround the Moon's Nodes in Vedic myth, and they are considered of paramount importance in chart interpretation. In fact, in assessing planetary power, the only Graha that is more powerful than the Sun is Rahu, the North Node of the Moon, because of his ability to swallow the Sun during a total solar eclipse. Ketu brings prosperity to the devotee's family, removes the effect of snakebite and illness arising out of poisonous matter entering one's body He grants good health, wealth, cattle and all around prosperity. Lunar and solar eclipses occurs because of Rahu and Ketu. My dob is 15-12-1972, at 12.05pm in chirala-ap-India. Can I wear cats eye gem.